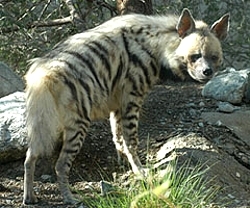 The Spotted Hyena , also called by some, the Laughing Hyena, is a famous scavenger from the plains and savannas often eating on the leftovers of other predators, and in some cases even taking food from lions and leopards, when hunting in packs, however they are also very skillful at hunting on their own accord and an bring down a huge wildebeest or an antelope on their own. Not only do they eat larger prey, but when times are lean and there is a family to feed, they will also kill and eat smaller mammals, birds, lizards, snakes or even insects in order to have enough to eat. Life, where they live is not always easy to live, and sometimes food and water are in short supply. Africa is becoming more and more populated, and many times they come into contact with humans, so much so, that the Masai tribes who live in African and Tanzania, actually had begun to leave their dead to be consumed by the hyenas . The hyena, however is also intelligent and very bold in its encroachment on human territory and many times have been blamed for livestock and at times, even human deaths. In a lot of areas now they are heavily hunted as pest animals, due to their predation and destructiveness, and also their large numbers. There are three types of hyenas, with the spotted ones, those made particularly famous in the Lion King film, being the largest of the three kinds. The other two varieties are striped and brown, which are a good bit smaller. Hyenas are very similar to dogs in their appearance, but actually are related far more closely to cats than to dogs. Hyenas live in groups, called clans. The clan can have as many as 80 animals and Hyenas are unique in that their clans are led by the females, not the males. They range over most of Africa and into Arabia and India. The female hyena will mate at any time of year, and produce three to six cubs which in the beginning are blind and helpless, after a gestation of 90-92 days. Cubs have similar colors to the adults. Adults and sub-adults carry food back to the dens for the infants, and hyenas are known to nurse infants that do not belong to their litter. Spotted hyena do not carry food back to dens, nursing young outside their dens and taking them to hunt early on.. 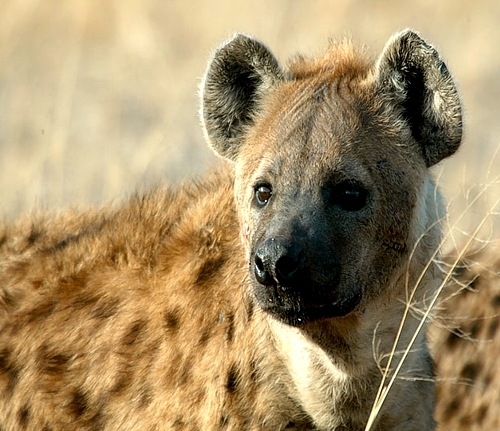 Spotted hyenas have good hearing and sharp eyesight at night. 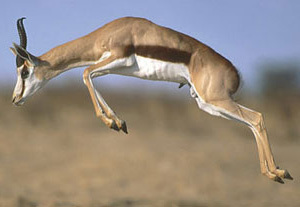 They are fast and can run for long distances without tiring. 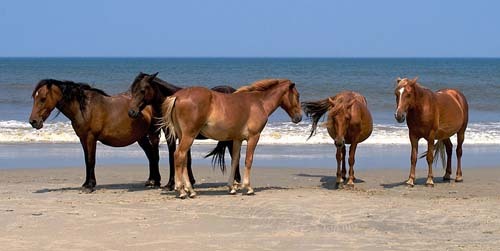 Packs work together effectively to isolate a herd animal and pursue it to the death. They often fight over the spoils, either among themselves or with other powerful animals like lions. Spotted hyenas are very loud and vocal and will make a wide range of sounds, among them, the laughing noise that gave them their name.